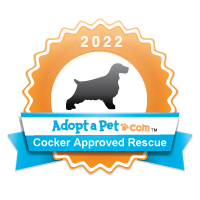 Cocker Spaniel Resources, Inc. is proud to be an advocate for the rescue, restore, retirement and placement of Cocker Spaniels. Our organization originally umbrella-ed under the organizational name of Nic of Time for Cockers is the main chapter. As a general rule, Nic of Time for Cockers runs simultaneously with Cocker Spaniel Resources. Cocker Spaniel Resources, Inc. has been a partner with PETCO Foundation since August 2007. Cocker Spaniel Resources, Inc. has been a partner with PetSmart Charities since September 2008. All adoptions have a five week money back guarantee. Our adoption prices are based on all the veterinary work which is completed before the adoption. We are a non-profit organization, and incur direct costs for spays/neuters, vaccinations, heartworm tests, flea/tick with heartworm prevention, grooming and micro-chips. The completed form can be returned to Cocker Spaniel Resources, Inc. by mail or via fax at 866-673-8571. You may also request a Word document version.